« Moving out, but only for a week! The pop-up shop was a huge success with a brilliant £1,721 raised. 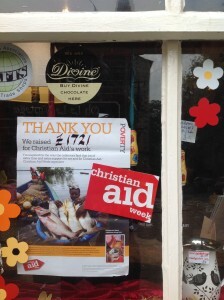 The money will be used by Christian Aid and will benefit many of those who need it most but the value of the shop is much more than this. The 1940’s week-end, this year blessed with gorgeous weather, brings thousands to the street and amongst all the costumes and dramas, a reminder of how fortunate we are is incredibly important but apart from that the camaraderie inside the shop with the helpers spending time with each other and the public, made for a special few days. Despite the fact that it took just a few hours to empty my stock but several days to get it back up and running, I am happy offer the shop again next year, I hope they want it. This entry was posted on Friday, May 30th, 2014 at 07:17	and is filed under Blog. You can follow any responses to this entry through the RSS 2.0 feed. Responses are currently closed, but you can trackback from your own site.